Police in New South Wales, Australia are using new speed camera-style technology to catch drivers using their mobile phones behind the wheel. The NSW Minister for Roads, Melinda Pavey, has hailed the tech as revolutionary and compared it to the 1980s’ introduction of breath-testing technology to catch motorists driving under the influence. More than 40,000 drivers were fined by NSW Police for using their phone behind the wheel between 2016-17. Campaigners are calling for the potentially lifesaving tech to be given the green light for use in the UK. 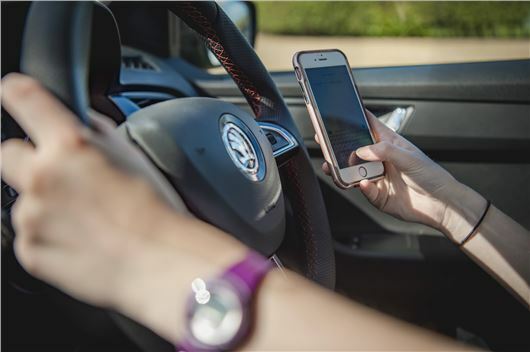 RAC Be Phone Smart campaign spokesman Rod Dennis said: "One of the real challenges in clamping down on this dangerous behaviour is making drivers believe they will be caught – and given the increasing prevalence of mobile phones, it is very much a global problem. “Motorists need to believe that using a handheld phone brings real consequences." “Motorists need to believe that using a handheld phone brings real consequences. New technology, such as that proposed by the NSW Government, could be a game-changer in the UK. If proven to be accurate in detecting illegal use, it could really help shift behaviour and, in turn, save lives." Since March 1 2017, drivers caught using a handheld mobile phone while driving in the UK receive six penalty points and a £200 fine, with the latter increased to a maximum of £1000 if the case goes to court. Newer drivers, who have a limit of six points within their first two years of driving, could find their licence immediately revoked if they're caught. They will then have to reapply for a provisional licence and retake their driving test. However, tougher penalties appear not to have changed public thought on using a phone at the wheel. An RAC survey of 1727 of its members in 2017 found that many continue to make calls and texts on the road, with 57 per cent of men and 43 per cent of women saying they regularly used their mobile while driving. Since 2012, many new cars come with Bluetooth systems fitted as standard, which allows the driver to pair and use their phone legally. However, even when using a hands-free kit, drivers can still be charged with careless driving, dangerous driving or driving without due care and attention if the police believe that it has influenced their standard of driving. In the UK, between 2013 and 2015, on average 24 people per year were killed in road traffic collisions where the driver of the vehicle was using their mobile phone - according the Department of Transport. That is the great sign that car market has recovered and it will surely impact positively on economy and on car makers and will generate more employment for the country. I am really happy that car market has posted positive growth. Good. Bring it on. No excuse for using hand held, either bluetooth connection to car or earpieces is safer. Safer still, switch it off before starting out. The offence should carry the same penalty as drink driving. We keep getting told there are too many vehicles on the road so this would reduce them. Using hands-free also distracts driver attention - especially when used for 'mobile business meetings' while driving. Good, ban them from driving for a long period. It's not holding the phone that's the problem, it's using it in any way at all that is dangerous because your brain is not fully engaged on driving. The only way to fix the problem properly is to use technology to prevent a phone from working at all when a vehicle is in motion. I hope they are able to discriminate between a phone call and streaming like radio or video in the back seat where children may be playing an on line game or watching a film! Using even a hands free kit to answer a mobile phone is still an enormous distraction to driving with proper full concentration. I always feel uneasy when using this equipment and make every effort to curtail the conversation until I can give it my full attention. To my thinking it should be against the law to use a mobile in a car whilst on the move. Good grief. This is all going a bit far, is it not? It's illegal to touch a mobile phone that's mounted on a dashboard, even if the device is only being used as a Satnav. I'm not advocating hairing along through town texting your mates. Nor would it be reasonable to tear along a motorway having a conversation with your mum with the handset against your ear. At some point, though, common sense must come into it. What if someone's driving along an empty dual carriageway. They pull the phone out of the side pocket, hold down the power button and switch it off. Or what if they reach out to press a "reroute" button on a maps client on a windshield mounted device? Is it better to do that than drive around without direction trying to read roadsigns in panic? Is that really worth 6 points and £200? One death caused by a mobile phone user is one too many. But so is one death caused by not wearing a seatbelt, one death caused by deliberate reckless driving, and one death caused by pure bad luck. Let's have some reason here, people. Let's not have machines punish good people for relatively trivial things. Can't come quickly enough-why people can't live without their mobile phones for a while in their cars is a mystery--they're probably lousy drivers anyway! About time too; I'm shocked by the number of drivers still using handheld phones and I think the penalties should be even higher. I recall back in the late 90's using a phone when driving and very quickly realising that my speed was erratic and I was wandering from side to side in the road or motorway lane; I've never used one since then. However I do think the same penalties are harsh when stationary in a traffic jam or parked on the hard shoulder or by the side of the road. Should be a prison sentence . Turn off check phone when parked safely not on the move.